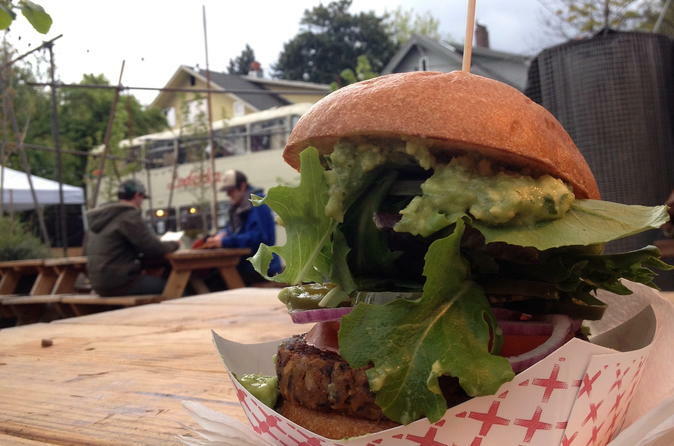 You've heard about Portland's famous food carts -- but the choices are overwhelming! Do you know there are over 60 pods, collections of food carts? Let us guide you on a culinary experience through some of our favorites, sampling everything from Oregon farm-to-table delights to snacks appropriate to late-night cravings. We'll meet you in the thriving SE industrial district, at our location near the real deal: the very first food cart pod. Here you'll be fitted for a bike and helmet, and we'll head on a neighborhood ride of 8-12 miles to three of our favorite food cart pods, as we unfold the fascinating (and only told by us!) tale of how Portland came to be the epicenter of the food cart craze. Sample food at each pod, with an option for beer or dessert, and some stops that tell a bit more to the food cart story. Meet in inner SE Portland Oregon. Bikes and helmets provided. You'll meet us at our inner SE Portland, Oregon location at the corner of SE Main Street and 9th Avenue, near the roasteries for Coava Coffee and Stumptown and only a few blocks from a half-dozen breweries and most importantly: the original food cart pods! Once you arrive, chat about your food preferences (and please alert us about any allergies!) while we fit you for a bike and helmet. You and your group will ride a few blocks to the first permanent food cart pod; this one is the epicenter of the food cart craze! We'll talk about how the food cart explosion began (a story told uniquely by us) before getting on our bikes again and working up an appetite with a pretty neighborhood ride to another pod in the Southeast quadrant of the city. Here we'll order a few things to sample, get treated to an amazing coffee in one of the most comfortable and beautiful spaces in Portland, and learn about how the food cart culture is constantly evolving. You'll stop again at a third food cart pod a little to the north, near where some of our longtime favorites originated, for more sampling. If your group is particularly hungry (and adventurous), we'll take a detour to one of the most unique food cart pods in the city, where you'll have an opportunity to sample food and have a beer if you like. Otherwise, we'll head to the pod where lots of our favorite food carts began and sample (yes) even more! Had enough to eat yet? We'll get back on the bikes, riding downhill back to the shop in inner SE. We'll end in early afternoon, with plenty of time for you to visit a garden or walk around the Hawthorne and Ladd's Addition neighborhoods to complete your pretty day in SE Portland.